Today I have a savory dish to share with you all. I’ve been trying to make one one-pot meal during the weekend to pack to school in the following week. But you know me, I won’t be making any boring stuff! So this week I’m making some Coq Au Vin. 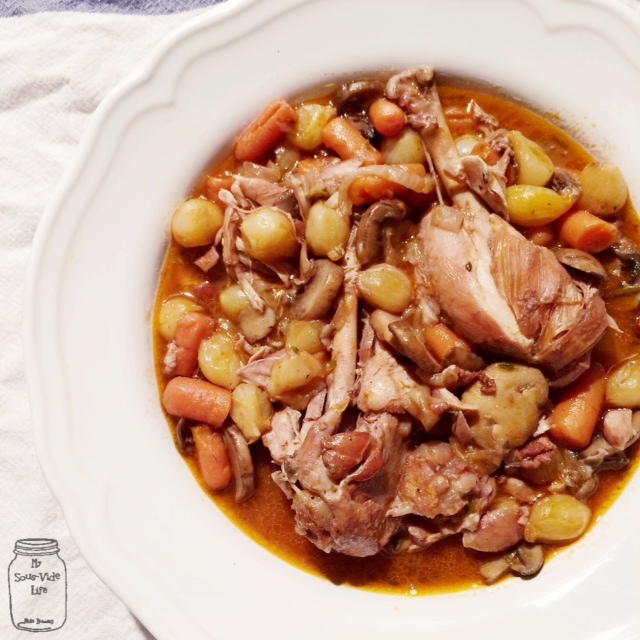 This dish is perfect for the chilly fall weather since it’s warm and hearty. And there’s something about the smell of this dish that just screams festive to me. I hope you enjoy! Add the bacon and cook over medium heat for 8 to 10 minutes, until lightly browned. Remove the bacon to a plate with a slotted spoon. Meanwhile, lay the chicken out on paper towels and pat dry. Liberally sprinkle the chicken on both sides with salt and pepper. When the bacon is removed, brown the chicken pieces in batches in a single layer for about 5 minutes, turning to brown evenly. Remove the chicken to the plate with the bacon and continue to brown until all the chicken is done. Set aside. Add the carrots, onions, 2 teaspoons salt, and 1 teaspoon pepper to the pan and cook over medium heat for 10 to 12 minutes, stirring occasionally, until the onions are lightly browned. Add the Cognac and put the bacon, chicken, and any juices that collected on the plate into the pot. 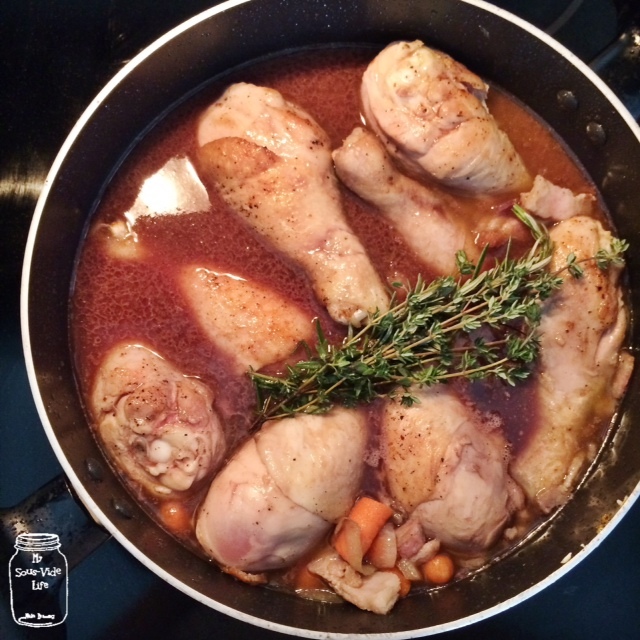 Add the wine, chicken stock, rosemary, bay leaves, and thyme and bring to a simmer, let simmer for 1 hour until the chicken is just not pink. Mash 1 tablespoon of butter and the flour together and stir into the stew.Add the frozen onions. In a medium saute pan, add the remaining 1 tablespoon of butter and cook the mushrooms over medium-low heat for 5 to 10 minutes, until browned. Add to the stew. Bring the stew to a simmerand cook for another 10 minutes. Season to taste. Serve hot.